In these tumultuous times, it is healthy to focus on America as a country of individuals who may have different political views, but who have a lot more in common than first meets the eye. We are a hopeful nation - hope in God, hope in our future, and hope in America as a people. Americans are hard working, resourceful, and resilient. There are few icons in America that represent these ideals better than the Statue of Liberty. 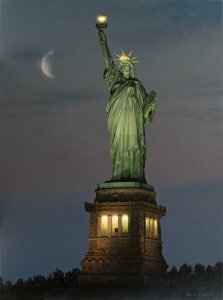 Historically, she has been a beacon welcoming those hoping to immigrate to our nation. Millions visit her each year to celebrate the fact that their ancestors came from around the world to make a new life – one filled with hope and freedom. And as we embark on this newest challenge to strengthen our nation and ensure opportunities for all, we can look again to her as she will be “A Beacon of Hope” lighting the way to a better life for all and a stronger, united America.